SoapBoxLA: LA Crime Stats: Can You Trust the Spin Doctors? 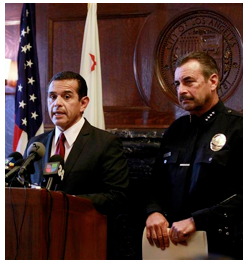 RETHINKING LA - LA’s Mayor Villaraigosa and Police Chief Beck have taken the city’s 2011 crime stats on the road, holding them aloft and touting the fact that the crime in Los Angeles continues to decline and is currently as low as it was in the 50’s. Villaraigosa’s exclamation that “The numbers are mind-boggling!” only serves to stir the embers of an old unresolved debate over the factors that play a role in crime rates. The larger overarching issue is one of simple data collection and analysis within LA’s City Hall. The City of LA is the largest city in the most populated state in the most powerful country in the world, and yet we allow City Hall to run itself without the accountability that comes from solid statistical analysis, conducted by professionals who challenge assumptions of causality. If this seems like a harsh charge to level at the Mayor while he’s still conducting his press tour, consider the fact that the FBI is currently examining, revising and reevaluating its crime definitions, data collection, and statistical analysis. If the FBI’s ego will allow for introspective analysis and evaluation, surely Los Angeles can ask a few hard questions about the pencils it uses to collect data, the procedures it uses to compile data, the innovative strategies it uses to analyze the data, and the actions it takes based on that data. Two days later the same CEO made a sudden reversal, announcing the termination of clinical trials due to the fact that the drug appeared to be killing people. Pfizer’s value dropped by $21 billion in just week. Pfizer’s experience is a clear demonstration of the fallacy of causation, the assumption that the presence of two or more factors implies that one causes the others. It also demonstrates that even the most skilled professionals operating with vast resources can master the information but still fail to understand the relevant factors or identify any cause and effect relationships. Trusting the professionals isn’t always the best way to go, as was demonstrated in a study conducted by a cardiologist named Lee Goldman. Using only four factors, Goldman developed a decision tree that evaluates the likelihood of heart attacks better than trained cardiologists in Chicago’s Cook County Hospital emergency room. Malcolm Gladwell, in his book Blink: The Power of Thinking Without Thinking, offers other examples of the difficulty professionals encounter as they collect information but struggle with decisions over what to discard and what to keep. While Villaraigosa’s befuddlement is understandable, it is hardly acceptable, especially in light of the stakes. Even more disturbing is the City of LA’s habit of collecting data as if it was simply fodder for the assumption machine, obligatory elements that were part of an old civic process recipe that continues to churn out the same results. The City of LA has long held the title of the Capital of Homelessness, yet when it comes to collecting data, it’s a volunteer driven process that clearly lacks the commitment that it deserves. Contrast this with the work of University of Pennsylvania’s Dr. Dennis Culhane who has used incisive data collection and analysis to identify effective and efficient tools for eradicating homelessness. Professor Culhane was featured in the 2005 Genius Edition of Esquire magazine as one of the brightest minds in our country for his work developing and promoting long term solutions to habitual homelessness. As Culhane works with other large cities, Los Angeles continues to use volunteers to collect homelessness data. Critics contend that this scenario allows for overcounts by those angling for HUD funds and undercounts by politicians who are protecting neighborhood reputations. The City of LA has also long held the title of the Capital of Busted Streets, yet when it comes to qualifying for funds and allocating resources, again, it’s a volunteer driven process. When voters approved Measure R, the half cent sales tax that would fund regional transportation improvements over the next decade, few realized that the $40 billion initiative would rely on traffic mode analysis performed by volunteers with a vested interest in the outcome. The City of Los Angeles deserves better than a mind-boggled Mayor in charge of a team that continues to collect data without being held responsible for determining cause and effect. Rick Cole, while Mayor of Pasadena, used hard data to determine the value of a parking space, its ability to generate revenue that could be invested in the immediate neighborhood, and its role in the regeneration of the local economy. LA, on the other hand, continues to allow debates over everything from public safety to parking to potholes to be driven by emotion and fueled by fear. Then it gets put through the cost-recovery spin cycle so that it turns into a revenue opportunity for the Mayor who can only express honest befuddlement at he looks at the city adrift. Meanwhile, Long Beach can analyze the value of a single parking space, its anticipated revenue, the appropriateness of its location and its relationship with the local economy, all from City Hall. While the ongoing decline in LA’s crime rate is a cause for celebration, the fact that we don’t know why things are improving is cause for alarm. If community policing is a big factor in the ongoing reduction in crime rates, why is LAPD militarizing the old Rampart station instead of building a new community center? The ongoing budget crisis in the City of LA demands that hard questions be asked of all department heads and of all departments, yet without reliable data and analysis, the people of LA are deprived of an essential and effective oversight tool. Now is the time for the City of LA to prioritize data collection and analysis in all that it does, from public safety to public works to public policy, and to do what counts while counting what matters.